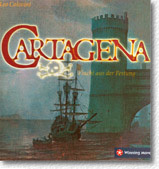 The Game: This game is inspired by the escape of pirates from the fortress of Cartagena in 1672. Each player controls a group of six prisoners which need to be led through an underground tunnel to the waiting boat. Movement of the pirates is achieved by playing cards from the player's hand. Each player starts with a set of 6 randomly dealt cards. The tunnel (prepared by randomly laying six large tiles at the beginning of the game thereby offering a large variety of tunnel layouts) is marked with 6 different symbols with each symbol appearing 6 times (once per tile) throughout the tunnel. A card played carries one of these symbols and the player moves one of his/her pawns to the next unoccupied symbol in the tunnel. If there are no vacant symbols left on the way to the boat the pawn is moved on the boat. The first player whose 6 pirates have successfully escaped to the boat wins the game. A players has one to three moves per turn with a move being either playing a card and moving a pirate forward or moving a pirate back into the direction of the start position to a symbol occupied by one or two other pirates. In the latter case the player collects one or two new cards (depending on the number of pirates on the symbol moved to). The game offers to variants: one where all cards (hand cards and draw pile) are concealed and another one where the hand cards and the next 12 draw cards are face up for a more tactical game. Playing Time: The game can easily be explained in 5 minutes and played in 30 to 45 minutes. Westpark Gamer's Opinion: We played the more tactical "Tortuga" variant with face up cards. The first problem we encountered was that it is not possible to plan ones move ahead. Each player has to wait for his/her turn before figuring out the best possible move. Luckily, we have no players in our group who want to find their "perfect move" by contemplating their position for minutes on end. This is certainly a problem with the Tortuga variant because of the many unconcealed cards. The tactical decisions are limited to grabbing the more important symbol cards from the open cards layout and to avoid moving backward to a symbol occupied by one pawn only (because you will get only one new card but open a possibility for another player to collect 2 cards by moving backward to the symbol you just drew to). We felt that a third variant where the player's hands are concealed but the draw cards are face up would not limit the "tactical" decisions but at the same time reduce the turn time of each player.